It’s what’s up top that counts. Independent analysts of Nucleus Research ranked 21 business intelligence and analytics products for functionality and usability on their Value Matrix to determine the platform that delivers best value. Read why Yellowfin placed top in comparison to vendors like Tableau, Microsoft, Sisense, and Qlik. 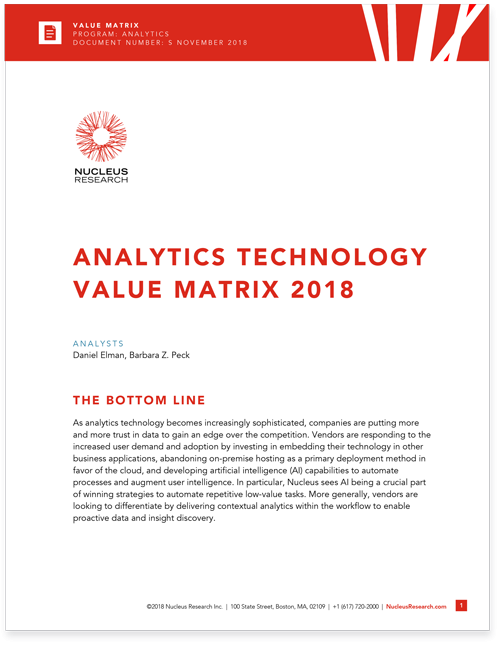 Download the Analytics Technology Value Matrix 2018 by Nucleus Research. As ranked by independent analysts, proving their place as a leading business intelligence solution that delivers excellent value for businesses. 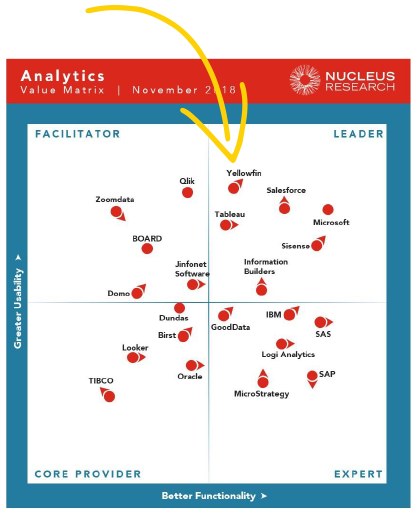 The Analytics Technology Value Matrix 2018 by Nucleus Research ranked Yellowfin highest for usability across all vendors and positioned them in the top-right Leader quadrant for overall value. The matrix compares BI and analytics products according to their functionality and usability against competitors and the overall market to decide the best value data analytics products. Yellowfin’s position in the Value Matrix is further backed by BARC naming Yellowfin a leader in their peer group for the price-to-value category in The BI Survey 18. Artificial intelligence was identified by Nucleus Research as one of the trends driving investment in analytics this year - and this capability is seen in both Yellowfin’s Assisted Insights and in the innovative Yellowfin Signals which automates data discovery. Download the Analytics Technology Value Matrix 2018 by Nucleus Research paper.